Most high-profile NFL prognosticators and media mouths expected the San Diego Chargers to be last in the AFC West. Most high-profile NFL prognosticators and media mouths expected the San Diego Chargers to be last in the AFC West. But it wouldn’t be Phillip Rivers’ fault. Last season was Rivers worst NFL experience. The squad won just four games, the lowest total in his illustrious career, but Rivers threw for a career-high 4,792 yards. For some reason, however, prior to the 2016 season most seemed reserved to the idea that the 34-year-old pigskin-pusher was on the demise. On Sunday, Rivers led the Chargers to a riveting 33-30 OT road win over Atlanta. The OG led all NFL QBs with 371 yards passing and teamed up with running back Melvin Gordon to help San Diego overcome a 27-10 deficit. Hes a legend in San Diego without a doubt. The way CBS analyst Dan Fouts described Rivers in the preseason reflects how most of the NFL world feels about the five-time Pro Bowler. Said Fouts, who knows all too well about being a dominant Chargers QB and never winning a ring: Phillips had a great career. Hes a tremendous competitor and you know that you are going to get 100 percent effort every time, and I admire him a lot. But unfortunately in the eyes of those same admirers, hes also pitied like Patrick Ewing and Charles Barkley for being ringless. And even if Rivers can find a way to amazingly lift the Chargers to a playoff berth, a Super Bowl run isnt logical or foreseeable to anyone. Hes running out of time, former NFL QB and CBS analyst Rich Gannon told The Shadow League. And I think the problem now is that hes been hit a lot. Hes as tough as they come and I just dont know how much better around him or upfront they are. Hes another guy thats in desperate need of an O-line and running game. If they can get better in that area and improve on defense, then youve always got a chance with Philip Rivers. I just dont know if they are good enough in those areas and that puts more of the onus as usual on Philip Rivers. Hes still got stuff left in the tank and hes still a one man wrecking crew when need be. If the running game can keep up and Gordon can continue to develop, that could be a good sign for the Chargers, who continue to ride the back of Old Man Rivers, who cant help but think what if the NY Giants, who selected him with the fourth pick and then worked out a trade with the Chargers to flip quarterbacks, had kept him. One glance at the current AFC West standings and you see San Diego sitting at the bottom of a tough division. Oakland, Denver and Kansas City are all solid clubs with playoff aspirations. Oakland has revamped a depleted franchise and Derek Carr conjures images of Jim Plunkett airing it out downfield. Denver continues to be serious contenders with Trevor Siemian taking a crash course in being a Top Shotta for a universally-hunted defending Super Bowl champion. Kansas City and Andy Reid are like a machine that despises inconsistency. The best thing about the Chargers — who at 3-4 are coming off two huge wins over Denver in Week 6 and over the Dirty Birds on Sunday and are quietly building momentum after an awful 1-4 start — is the same thing that has been the best thing about the Chargers since 2006 when Rivers took over the helm. And unfortunately, as his career enters its twilight, hes farther from that elusive Super Bowl than hes ever been. Theyre not going to win the Super Bowl this year, CBS analyst Phil Simms told The Shadow League. “I could be wrong. Is he running out of time? Yes…Hes a tremendous player and a great competitor. Hes done well under some tough circumstances. He seems to play really, really good football every single year and he pulls the team close and they almost pull it out, but they never seem to pull it out. Unfortunately all we judge QBs by are titles, Simms continued. “Its a shame because that will be one of the first things they say about him, ‘Oh, but he never won a Super Bowl.’ Hell be Dan Marino. A hell of a QB who just couldnt win the big game. Rivers is a true victim of the Brady and Belichick era of dominance that rivaled Lil Weezys rap career at its peak. Rivers lost a tough playoff game to Brady and Belichick (24-21) in 06 and then lost the AFC Championship to The B-Boys in the 2007 season. In 2008, 2009 and 2013, he dragged three more subpar Chargers teams to playoff appearances, but he never reached a Super Bowl. 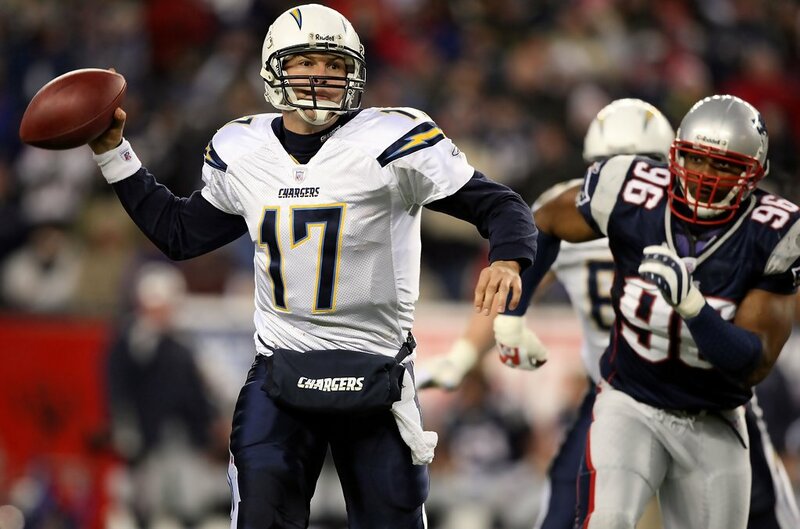 Rivers was one of three studs taken in the lauded 2004 NFL Draft. Eli Manning and Ben Roethlisberger have four rings between them. Rivers has the stats to match any air master. His nearly 44,000 yards passing is self explanatory. Hes just never had the squad to truly challenge the beasts of the AFC and the Patriots existence has been a roadblock to the dreams of many an AFC team the past decade. When Josh Lambo’s 42-yard field goal in overtime gave San Diego its second road win in 12 games on Sunday, it kept hope alive for Chargers fans and Rivers. At this point, only a gift from the football gods can get Rivers into the playoffs and then a Super Bowl in the near future. He wont stop gunning though. Hell go out slinging that rock like an old school, rubber-armed starting pitcher who knows his job is just to eat innings and keep plugging until something gives.